This stunning and gorgeous necklace is the one that every lady wants to have! The necklace can be worn alone for a everyday pair and it is also good to be layered with other necklaces. Perfect for all occasions! 0.17 carats of stunning blue diamonds are set in 14k white gold. Bar measures 1.7mm x 26mm and comes with an 18 inch cable chain. 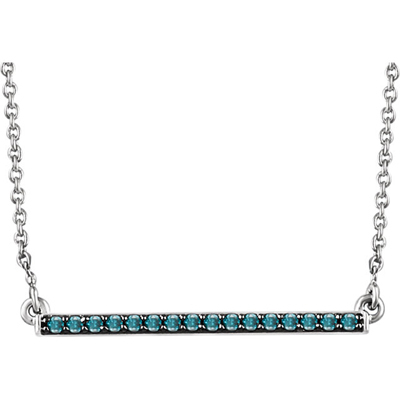 We guarantee our 14K White Gold Blue Diamond Bar Necklace to be high quality, authentic jewelry, as described above.